Ben Carson was just appointed head of Housing and Urban Development by Donald Trump. This is good news, and am very glad especially to see someone who used to be Seventh-day Adventist (but fell away in the presidential race) in such a high position. For all those who are concerned about the unbalance of power in America (like I am) with Republicans controlling everything, at least there is a voice for the Sabbath near the top. This video explores some of the similarities between the mother whore of Secularism, and its current beloved baby. Neither Evolution or Global Warming have observed evidence in their favor, adherents to both make outrageous statements to support their belief, both are defended with earnest zeal by the “consensus”, both require the force of law to promulgate their beliefs, both have cool computer animations to convince of their truthfulness, and, most importantly, both deny the God of creation. This is big news. It is not every day you see something that you can definitely say is prophecy fulfilling right before your eyes, but what happened on January 21, 2014 with the pope sending a message to charismatic leaders in America, and they responding enthusiastically that “the protest is over” (meaning they are willing to go back to the Mother of Harlots), is amazing to see. I highly recommend everyone to study this out, to see what the talking points are, how the enemy of all truth and righteousness is making his words softer and smoother than ever. On Jan. 21, 2014, Kenneth Copeland Ministries was blessed to receive a personal video message from Pope Francis. The attendees of KCM’s annual Ministers’ Conference were greatly inspired when Bishop Tony Palmer (charismatic Anglican), a longtime friend of Pope Francis, presented the pope’s greeting and a message he prepared specifically for them! Join with us in prayer for unity in the Body of Christ throughout the world! Pastor Doug Batchelor has put up an excellent dissection of what this means. He makes it clear that this is a call for Protestants to lay down their arms, and to come back into the “loving” fold of the Roman Catholic Church. It is so scary to see the many Protestant attendees clap and agree with the pope’s request!! Surely we are near the end times, when Satan will work with all deceivableness of unrighteousness. A bill was introduced in the House of Representatives in America in 2011 asking the President to create a special envoy for religious minorities in the Near East and South Central Asia. While the bill passed 402 to 20 in the House, by the actions of just one senator, it has been on hold in the Senate since then. Here is a chance to write your senator to ask that a special envoy be appointed in this region of the world where many Christians especially are persecuted. If you lived in those areas, wouldn’t you want someone to treat you this way? So what’s been going on with the spread of this book so far this year? It doesn’t seem like much, as i just go around teaching English in Japan, and keeping in touch by email with people, but fortunately some things have been going on. Japanese: Still around 200 in stock. The church that showed so much interest in them last year has zero interest in them now. Filipino: The man who i sponsored for 3 years to travel around spreading these books is still working overseas. He says he wants to come back to the Philippines and work on this again, so i still have hopes. Update July 8, the Filipino man contacted me after a silence of several months saying he is stuck in Sabah and needs a way to get back to the Philippines and he is sorry he didn’t restart working on spreading this book earlier. Hopefully we can get him back, and he can start again spreading God’s words soon. Indonesia: A good friend i made there 2 years ago said in a email about 1 year ago that the translation was finished. But then he basically stopped communicating. Last month he said again that the translation was finished, but when i pressed for more info and showed interest in helping get it printed or whatever, communication stopped again. Vietnam: The plan is to print 10,000 of this edition along with 10,000 of the 1911 edition to go with the General Conference plan to spread the book this year. Thailand: Approximately 200 books left. I’m hoping it can be proofread and reprinted. Myanmar: The book is slowly being distributed. India: This is where most of the action is. In the north, my pastor friend is in the process of getting the Tibetan one proofread, and hopefully reprinted soon. We had to throw away all the copies printed around 7 years ago, so i’m really praying that this time will be successful. He is also interested in more Nepali copies. In southern India i am currently sponsoring a man with the idea to print this book along with Steps to Christ and maybe some health literature in several languages. The Kannada translation is currently in the final proofreading stage, and i have hope it will be printed this summer. The Gujarati and Marathi versions are supposedly translated, but it is hard to get a handle on exactly where they stand. Pr. Randy Skeetes is scheduled to come give meetings there in January, so we are planning to have this book in several languages for the meetings to try and introduce young, on-fire SDA members to this book so they will want to spread it in their towns. This Brother will meet a high church official this Sabbath, and plans to introduce this 1858 edition to him. May God’s will be done. Zimbabwe: A man i’ve known thru the internet for maybe 9 years or so has kept in contact, and finally at the end of last year i offered to support the translation and printing cost for the Tonga version. He wrote back in about a week saying it was done, whcih just heightened my concerns, so i told him to be careful about it and take time and do a good job. He wrote recently that in getting help with some words translating, he is able to reach some people he would not be able to reach otherwise, and one man has already become convicted of the truth of this book. Ghana: Some feelers were put out, but not much interest. Armenia: Basically in the same stage it was 2 years ago – translation is finished, and awaiting proofreading. It is very frustrating, because i’m in close contact with the translator, but still nothing seems to move forward on this project. Romania/Spain: The Romanian translator has just offered to work full-time to spread this book, so we are planning to reprint it. He has also retranslated the Spanish version, and after it gets proofread, we plan to print it. I’m hoping something good will happen with the German translation too while he is at it. I was really hoping to push the book this year, as this is the year the General Conference is especially putting emphasis on to spread the Great Controversy book. But even if it doesn’t go as quickly as i had hoped, it is good to see some progress. Put up a video made of pics i took last year, with around 4 minutes of spiritual journey talk at the end. I’m sure that October 22, 1844 was the correct date for the Day of Atonement that year. Knowing that raises lots and lots of questions tho, not least of which is why does God still move according to his calendar, and should we also? We hear a lot today about how there should be no mention of anything “religious” in a public setting, as that might somehow favor one particular brand of religion over another. This is a concocted effort to drive Christianity out of public space, as it is the religion that shows us our sins, and that there will be a judgment for our actions in this life. So what did our founding fathers have to say about Christianity/religion? For example: What was one of the first things George Washington did when he was elected president? “John Adams: The general principles on which the fathers achieved independence were the general principles of Christianity. I will avow that I then believed, and now believe, that those general principles of Christianity are as eternal and immutable as the existence and attributes of God. … The Christian religion is, above all the religions that ever prevailed or existed in ancient or modern times, the religion of wisdom, virtue, equity and humanity. Samuel Adams: I [rely] upon the merits of Jesus Christ for a pardon of all my sins. … I conceive we cannot better express ourselves than by humbly supplicating the Supreme Ruler of the world … bringing in the holy and happy period when the kingdoms of our Lord and Savior Jesus Christ may be everywhere established, and the people willingly bow to the scepter of Him who is the Prince of Peace. … We may with one heart and voice humbly implore His gracious and free pardon through Jesus Christ, supplicating His Divine aid … [and] above all to cause the religion of Jesus Christ, in its true spirit, to spread far and wide till the whole earth shall be filled with His glory. John Hancock: That the spiritual kingdom of our Lord and Savior Jesus Christ may be continually increasing until the whole earth shall be filled with His glory. read more from "america’s founding fathers were christian"
I’ve lived in Japan on-and-off for the last 23 years, and can still remember the dynamism of the whole culture when i first came. Osaka’s skyline was like a huge erector-set, with tall cranes furiously putting up new buildings everywhere. The people walked quickly and while the natural Japanese mood of “melancholy” was abundant, there was a looking-forward to the future, where anyone could do just about anything they set their minds to. One of my English students was a normal guy – jazz drummer, and told me how his friend spent around 700,000usd on a new condo, and wasn’t even planning to live in it! He was a speculator, planning to sell it higher later. This student himself borrowed over 300,000usd to start up his tiny jazz studio/cafe in the nightclub area of Osaka. Wonder what happened with that? I can still remember the day around 6 months after i arrived when the stock market crashed. The standard response was “It will come up again.” There were magazine articles explaining how Japan was “unique”, and different from other countries, so the economy would dip a bit, and then come back stronger than ever, and be number one in the world. Of course a few years before that there was a man in America who wrote a book something along the lines of “The Japanese Century”, referring to how the 21st century would see Japan become the dominant power in the world. Funny thing happened tho, that same man is now studying Chinese – ha! Today Japan announced the first red ink in international trade in 31 years. 2011 Japan’s red ink. The stated reasons are the cleanup from the tsunami, tsunami cleanup pics and even bigger – the shutdown of many nuclear plants after the Fukushima problems, with the slack in electricity production being taken up by importing more oil and coal. This is ominous, as the export sector has been propping up the economy, and if Japan loses its reserves, there is basically nothing left financial wise. Which leads to a big question – what will happen to the yen? The yen has been on a tear over the last few years, rising against all the other major currencies. When i left Japan in 2005, it was around 110jpy/1usd, but now that is 76/1. That is great for earning in yen, and sending to other countries to help people, but what will happen if Japan self-implodes? Three years ago a pastor at a Seventh-day Adventist church here in Japan prayed for a better economy, but i told some of the members afterwards that it might be better for the economy to collapse totally, so that the people would be forced to consider eternal realities. As long as things go along somehow, people will not consider what is important in life, and will continue to reject God’s gift of salvation in Jesus Christ. 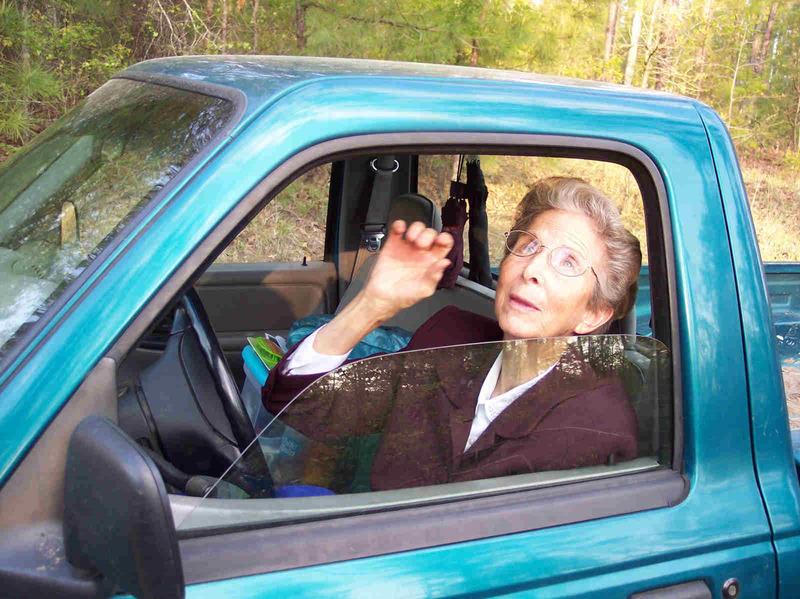 Picture taken in April 2009 of Dr. Agatha Thrash in her trusty pickup truck, looking up at a bee swarm at Uchee Pines Lifestyle Center. I’ve had lots of pics up, and yet very few of them get indexed by the search engines. Recently i saw where “Agatha Thrash”, which used to display my pic in the top 5 results, now doesn’t show at all, except for 2, totally unrelated pics. I’ve been praising God for a strong leader appearing to lead his remnant people since his election last General Conference Session in Atlanta, 2010. For over 30 years, the largest part of my lifetime, God’s flock has been led by shepherds who frankly, seem to have been like “men pleasers” more than “God servers”. Finally that part of church history is behind us forever (i hope), and now we must move forward, as it is late in the day, and Jesus’ coming is very soon. So in what way can i help lift up my leader’s arms, like Aaron and Hur did for the leader in their day? One of the ways is to make his talks more easily accessible, which is why i’m trying to pull together all the links to his videos available on the internet. Please note that while i’m trying to uplift his arms (message), i’m not trying to uplift him as somehow “inspired” or anything like that. In fact, recently i wrote him asking for him to publicly repent for the Seventh-day Adventist church’s great sin in allowing abortions, but just got a standard “leave it to the woman” response. May we stand as strong for the 6th commandment, as we do for the 4th. Each media link has: What the media is about, and if possible where and when, and then the length of the media in hh:mm:ss. They will be as much as possible in order from newest to oldest. I recommend that everyone start viewing with the “Go Forward” sermon on 2010/7/3, listed below. Ted Wilson’s part is from 29:23 to the end. Ted Wilson’s part is from 20:30 to the end. Please note that this following is his first sermon after becoming president of the Seventh-day Adventist church, and is his defining moment, and a defining moment for God’s remnant church. God bless you Brother!! I had a free hosting service with a place called “Pro Hosting” for many years. It was my first foray into the wild world web, waaaay back in the 20th century 😉 But after i found WordPress, i stopped updating it, and then a couple of years ago they quit allowing me to do anything with it. I just let it go until recently, as i see now that they have taken my site down from the web, i decided that all that juicy info about my life, along with some really cool pics (who is he kidding?) should not be kept from the public at large, so put it up again today on this domain. As for the diary stuff, reading again about what i felt in my first trip to India, and the emotions in helping my homeless friends etc., helps give me a renewed sense of definition to my little, mostly fruitless life. May God forgive me, and use me in the future to advance his kingdom.